All of us use browsers, but few know how they actually work. We are so used to them, that we take them for granted, but behind every browser lie millions of lines of code. In the next few paragraphs, I will try to show you how exactly browsers work. The user interface - it’s the space where the user interacts with the browsers. This includes the address bar, back and next buttons, home button, refresh, bookmarks, etc. Every part of the browsers, except the window where you see the requested page. 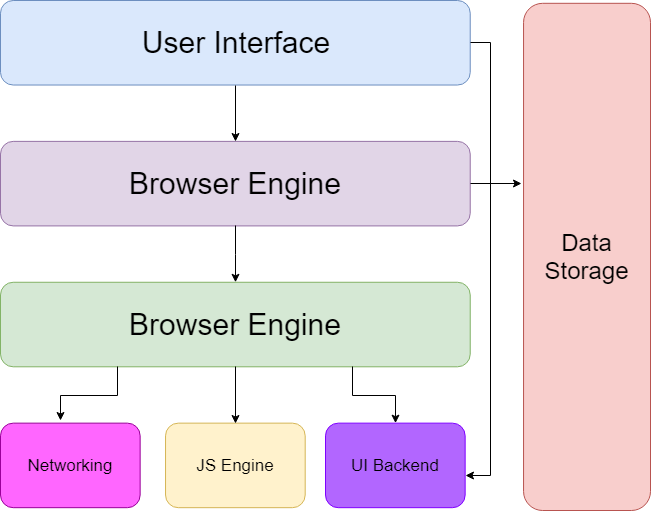 The browser engine - the browser engine works as a bridge between the User Interface and the rendering engine and communicates with the Data Storage Component. The rendering engine - responsible for displaying requested content. For example, if the requested content is HTML, the rendering engine parses the HTML and CSS and displays the parsed content on the screen. With the help of plugins, the rendering engine can also display other media like PDF documents. Networking - responsible for handling network tasks such as HTTP requests, Web Sockets, Web RTC (Uses Real-Time Transport Protocol, which uses UDP). The network component may also implement a cache of retrieved documents in order to reduce network traffic. UI Backend - used for drawing basic widgets like combo boxes and windows. This backend exposes a generic interface that is not platform specific. It underneath uses operating system user interface methods. Data storage - this is a persistence layer. Used for HTTP Cookies, Browser caching, Web APIs, such as Web Storage and IndexedDB. The responsibility of the rendering engine is to display the requested contents on the browser screen. By default the rendering engine can display HTML and XML documents and images. It can display other types of data via plug-ins or extensions, for example displaying PDF documents. Different browsers use different rendering engines: Internet Explorer uses Trident, Firefox uses Gecko, Safari uses WebKit, Opera and Chrome uses Blink, which is a fork of WebKit. Convert bytes to characters - the browser reads the raw bytes of HTML and translates them to individual characters. Identify tokens - converts strings of characters into distinct tokens, for example - <html>, <body>, etc. Convert tokens to nodes - tokens are converted into objects, which define their properties and rules. 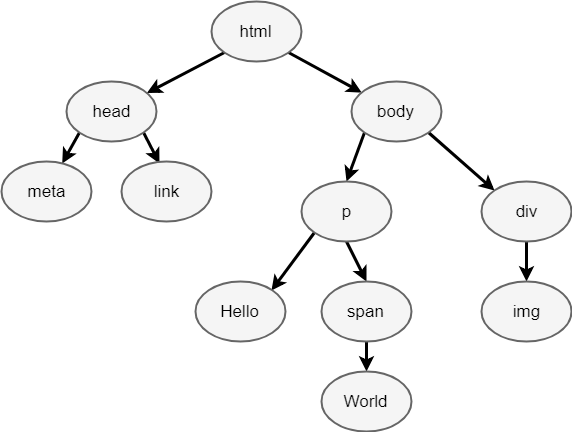 Build the DOM tree - finally, the created objects are linked in a tree data structure that captures the parent-child relationships defined in the original markup. Why does the CSSOM have a tree structure? When computing the final set of styles for any object on the page, the browser starts with the most general rules applicable to that node and then recursively refines the computed styles by applying more specific rules; that is, the rules ‘cascade down’. 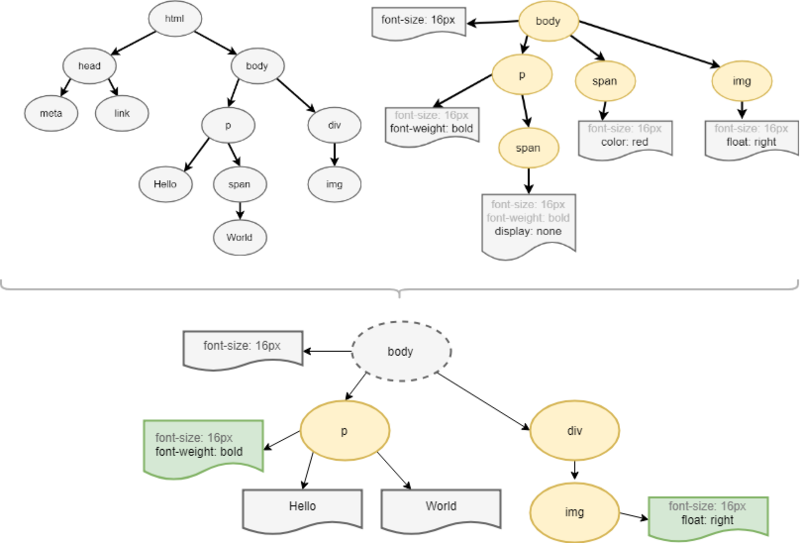 Note that the above tree is not the complete CSSOM tree and only shows the styles we decided to override. Every browser provides a default set of styles also known as ‘user agent styles’. After the rendering engine creates the DOM and CSSOM, it combines them into a render tree, which is used to compute the layout of each visible element and serves as an input to the paint process that renders the pixels to the screen. If the style is not loaded and parsed yet, the script will get wrong answers and apparently this can cause lots of problems. It seems to be an edge case but is quite common. Browsers implement different strategies for these scenarios; for example, WebKit blocks scripts only when they try to access certain style properties that may be affected by unloaded style sheets. Omit nodes that are not visible (script tags, meta tags, and so on). They do not reflect the rendered output. 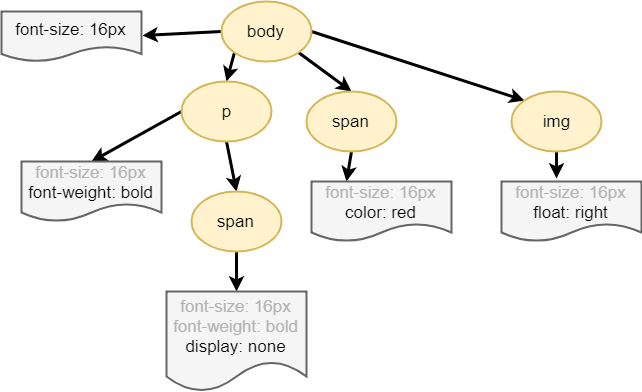 The hidden via CSS nodes are also omitted from the render tree: for example the span node - in the example above, because of the “display: none” rule. Emit the visible nodes with content and their computed styles. The final output is a render that contains the content and style information of all the visible content on the screen. We can now proceed to the layout stage. When the render tree is created, for each element, its coordinates are calculated. The layout is a recursive process. It begins at the root renderer, which corresponds to the <html> element of the HTML document. Layout continues recursively through some or all of the hierarchy, computing geometric information for each renderer that requires it. The model of the web is synchronous. Developers expect scripts to be parsed executed immediately when teh parser reaches a <script> tag. The parsing of the document halts until the script has been executed. If the script is external then the resource must first be fetched from the network–this is also done synchronously, and parsing halts until the resource is fetched. Developers can add the defer attribute to the script, in which case it will not halt document parsing and will execute after the document is parsed. While scripts are executed, another thread can parse the rest of the document and finds out what other resources need to be loaded from the network and loads them. This is called speculative parsing. In this way, resources can be loaded in parallel connections and overall speed is improved. The speculative parser only parses references to external resources like scripts, styles sheets and images. Style sheets have a different models. Conceptually it seems that since style sheets don’t change the DOM tree, there is no reason to wait for them and stop the document parsing. There is an issue though, of scripts asking for style information during document parsing stage. Reflow happens when the browser must re-calculate the positions and geometries of elements in the document, for the purpose of re-rendering part or all of the document. The reflow is a user-blocking operation in the browser, so it’s useful for developers to understand how to improve reflow time. There is a great document, outlining which properties forces reflow - What forces layout / reflow. Avoid unnecessary complex CSS selectors - descendant selectors for example - which require more CPU power to do selector matching. If you make complex rendering changes such as animations, do so out of the flow.